An elderly man has been rescued from his home on Barra after it flooded in heavy rain. The incident took place in Castlebay at about 01:00. The fire service, ambulance personnel and RNLI crew members took part in the operation. The man has been taken to hospital for checks. 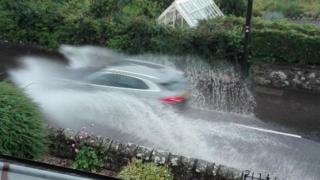 The Western Isles have been affected by torrential downpours and thunderstorms. A weather warning was issued for much of the west of Scotland. In another incident, a family had to be rescued from a campervan after a river burst its banks on Skye. The two adults and two children had been staying beside the river at Glendale. The alarm was raised at about 05:30. They were helped to safety and none of them required medical treatment. The islands of South Uist and Harris have had their the wettest 24 hours in 20 years, according to Met Office statistics. Tiree in the Inner Hebrides, often one of the sunniest places in the UK, has also had its wettest August day since records began in 1927. The Met Office had earlier warned of heavy rain overnight and into Wednesday morning.